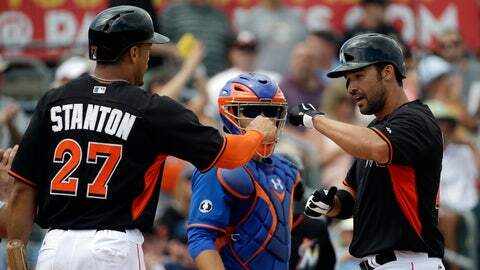 Miami Marlins' Garrett Jones, right, fist-bumps teammate Giancarlo Stanton after the two scored off Jones' two-run home run in the fourth inning. JUPITER, Fla. (AP) — Ike Davis and Travis d’Arnaud each hit a two-run homer, leading the New York Mets to a 10-2 rout of a Miami Marlins split squad Saturday. Wilmer Flores had a three-run homer among his three hits and drove in four runs. Chris Young was 3 for 3 for New York. Mets starter Bartolo Colon allowed two runs and five hits in 6 2-3 innings. He struck out three without walking a batter. New York won its fourth straight, preventing a six-game sweep by the division-rival Marlins this spring. The first home run of the spring by d’Arnaud gave the Mets a 2-0 lead in the second. "He’s got power and he’s been working to get himself in a better position to get a hit," manager Terry Collins said. "He got a ball today he could handle, it was a good swing for him and, hopefully, it will relax him. "But I don’t want him swinging for the fences, either." 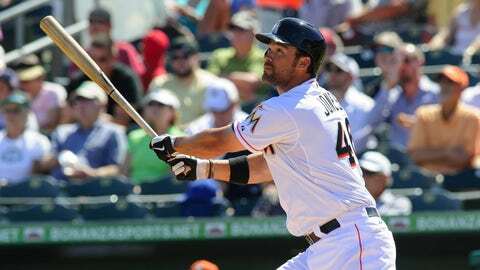 First baseman Garrett Jones is hoping for a turnaround with the Marlins. In the fourth, Flores’ first home run made it 5-0. Davis connected in the seventh on his 27th birthday. Miami had won four in a row. Mets: Colon struck out three and walked none. He also hit an RBI single in the sixth that scored Flores, and ended up on third before the inning ended. Running the bases was an unusual experience for the hefty Colon, who had spent nearly his entire career in the American League before signing a $20 million, two-year contract with the Mets in the offseason. "Honestly, I was a little scared," he said through a translator. "I haven’t done that in a while. … Thankfully, nothing happened." Marlins: Brad Hand was on the mound for four innings, allowing five hits, five runs and two homers. He threw 76 pitches, 47 for strikes. Davis celebrated his birthday by hitting his second home run of the spring. Competing with Lucas Duda for playing time at first base, Davis was playing in only his fifth Grapefruit League game. He was out for three weeks with sore calves. Duda has also missed extensive time with a leg injury. With a week left in spring training, Marlins manager Mike Redmond still has no target date for setting his 25-man roster for the regular season. Miami has 39 players in camp, 29 who are on the 40-man roster. "We’ve started the discussions over the last few days and I think any manager would probably say they’d like to have their guys as soon as they can to have them playing together," Redmond said. "We have a lot of tough decisions and a lot of competition. "The tough decisions is a good thing and it’s going to make us all better." Marlins second baseman Derek Dietrich, who had his nose broken by a bad hop Thursday against the Cardinals, was fitted Friday for a protective mask to wear in the field. He was expected to go for a re-fitting on Saturday. "He’s able to hit today and take batting practice, but no groundballs until he gets that mask," Redmond said. "As soon as he gets that mask he should be available to play, probably Monday." Mets: Second baseman Daniel Murphy went 0 for 4 with a walk in minor league at-bats. He ran the bases before the game. 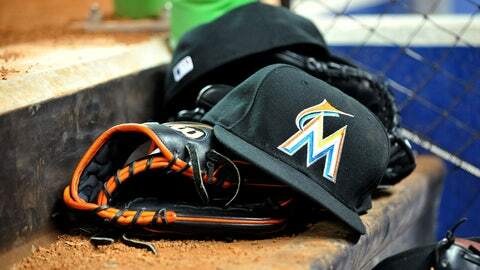 Marlins: Infielder Ed Lucas is expected to be back from a hamstring injury and ready to play on Sunday. … Greg Dobbs, who had a quadriceps injury, was going to hit in a minor league game Saturday. … Middle infielder Rafael Furcal, also out with a hamstring problem, planned to run the bases this weekend. He is expected to play in a minor league game Monday.